Each person has his or her own strong opinion about what is the best pizza topping. The next time you order a pizza, try one of these regional favorites from around the USA. Pizza is a staple of the American diet, and just like other regional food specialties, the toppings that people prefer on their pies also tends to change based upon location. Although pizza is usually good, you may find it boring to keep getting the same toppings every time you order a pizza. The next time you get a craving for Fremont street pizza in Las Vegas, consider switching it up and trying out one of these favorite toppings from other regions. While many people like green peppers on their pizza pies, hot jalapeños make a surprising topping option for many pizza lovers. The heat from jalapeños is cooled off by combining it with Monterey jack or fresh mozzarella cheese. Jalapeños also pair well with onions, sausage or pepperoni for some additional heat that is tempered by the savory flavors of these toppings. Although spinach makes an excellent addition to the side salad you order to go with your pizza, this vegetable is on the top ten list of toppings in the USA. As a pizza topping, spinach is the most popular in California through Washington State as well as in parts of the northeast. 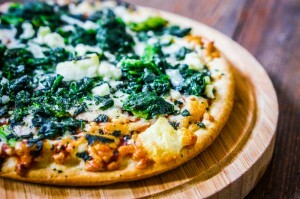 When put onto pizza pies, spinach is often paired with an exotic cheese such as feta instead of the traditional mozzarella. Asparagus is a springtime vegetable that is often roasted or steamed. These green stalks also make excellent toppings on a pizza. Asparagus pairs well with other toppings such as bacon for a hearty slice. Other pairings for asparagus on pizzas include caramelized onions, red onions, Canadian bacon and prosciutto. Pizza pies are a fun way to experiment with different flavor combinations, as the high cooking temperature, bubbly crust, and fresh ingredients come together in unique ways.